Marquesa wins First Place and the Color Champion at the Big E Alpaca Fleece Show in 2016! Marquesa, what a sweet young female! Already at such a young age she is incredible easy to handle. Her conformation is outstanding, with nice straight legs, a solid frame, and a straight top line. Her fleece shows a lovely bold crimp that is dense and very fine. 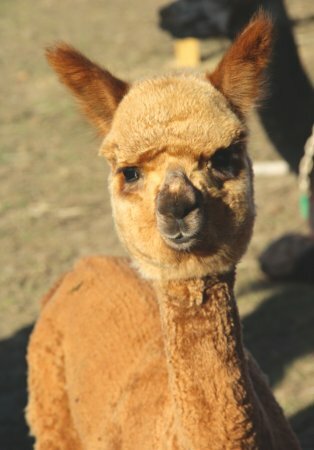 Marquesa's dam, Marcella, is a wonderful brown alpaca with very dense fleece, with a gorgeous phenotype. 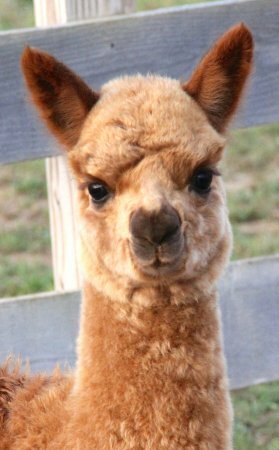 Marcella's sire is CT Estrada, a fawn alpaca that has won eight champions and over 30 first place ribbons! 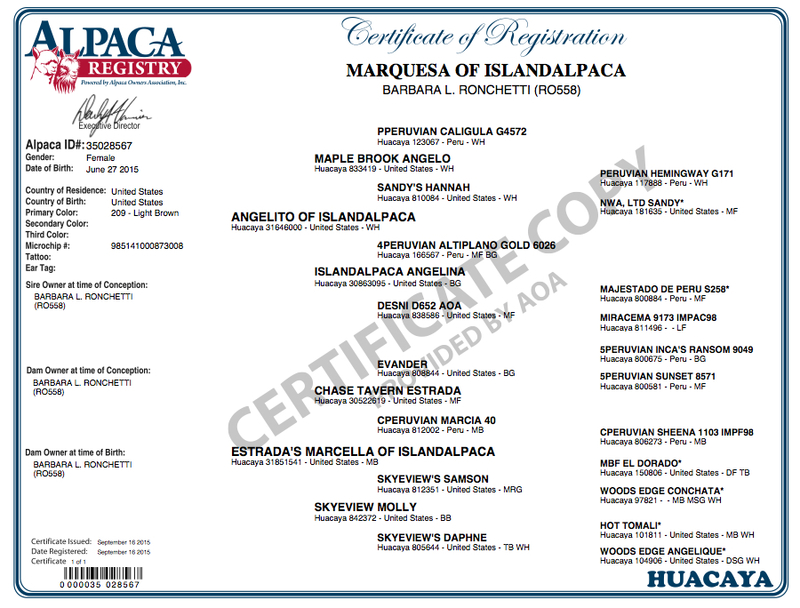 Marquesa's sire, Angelito, is a beautiful bright white alpaca that has an outstanding phenotype with a strong frame. Angelito has produced over 10 pounds of fleece nearly every year. He is a fleece producing machine! 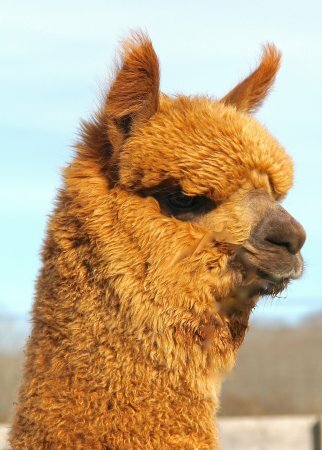 Angelito's dam, Angelina, is a champion alpaca who has a very strong genetic line. 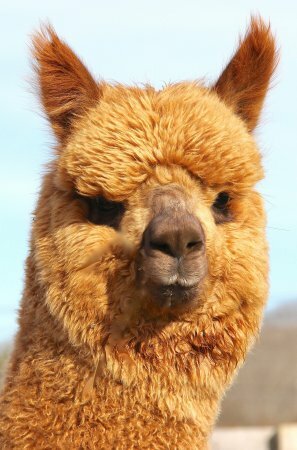 Angelito's sire, Maple Brook Angelo, is a beige alpaca that has won several champions and first place ribbons! 2016 Big E Alpaca Fleece Show judge Arturo Pena commented: "Excellent Fineness and beautiful handle." Fleece Score Highlights: Fineness/Handle, 18 out of 20. Micron, 7 out of 8. Length, 6.5 out of 7. Color, 5 out of 5 possible point. Marcella won second place at the 2014 Empire Extravaganza Alpaca Fleece Show! 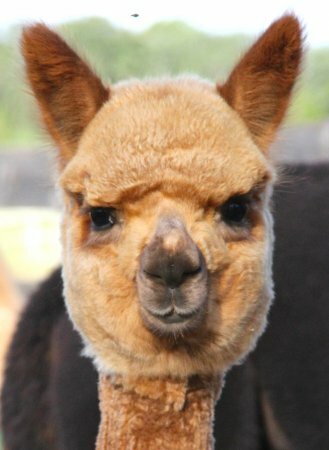 Marcella is another one of the farms curious alpacas who is a gorgeous medium brown female. She has beautiful tightly crimped fleece that is very fine, uniform, and dense. She has the perfect phenotype... She's thick-boned, has a gorgeous top-knot and face, she has a wonderful conformation, and overall has a very pleasing look. She has her dam Skyeview Molly's gentle and caring nature and her sire CT Estrada's looks and stature. Her sire is our very own and he has won multiple champions and blues and her dam's lineage has quite a bit of grey in it and she's had five cria so far, three of them being grey! Maybe Marcella will do the same! 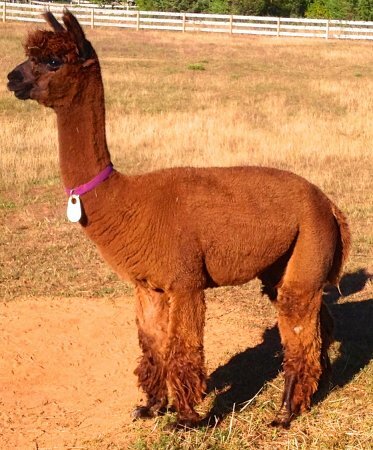 2015 Southern Select Alpaca Show Spin-Off judge Elizabeth Taylor commented: "Very lofty. Wow the brightness. Very nice!" 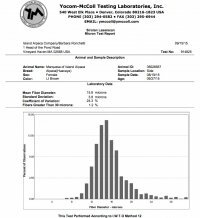 Fiber Criteria Highlights: 1st Impression, 4 out of 5. Absence of Guard Hair, 4 out of 5. Uniformity of Length, 5 out of 5 possible point. Spinning Criteria Highlights: Ease of Carding, 5 out of 5. Ease of Drafting, 7 out 8. Ease of Spinning, 10 out of 10 possible points. Yarn Criteria Highlights: Usability, 7 out of 7. Brightness/Luster, 5 out of 6. Handle, 5 out of 6 possible points. 2014 VAOBA Alapca Expo - Judge Ursula Munro commented: "This fleece is maintaining good fineness and soft hand into maturity. Good uniformity overall." 2014 Green Mountain Alpaca Fall Spectacular Show - Judge Cheryl Gehly commented: "Holding good fineness for age!" 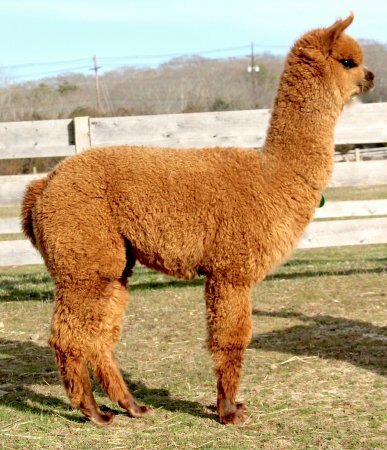 2014 Empire Alpaca Extravaganza Show - Judge Wini Labrecque commented: "Fleece exhibits good hand, consistent in color." Fleece Score Highlights: Length 6.5 out of 7. Color, 5 out of 5 possible points. Angelito, just like his sisters: Angelica, Anika, Silver Angel, andPenelope look just like their dam Angelina, a champion and blue ribbon winner. 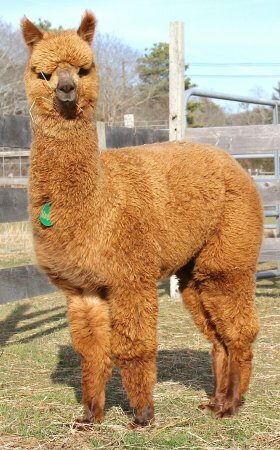 Angelito is one great looking alpaca with very fine fleece with terrific density and staple length, with a "very thick, pleasing muzzle, and a high frequency fleece, nice structure both in the rear and back legs ", commented Alpaca Judge, Wade Gease. Angelito, just like all of his siblings and dam, have an almost perfect phenotype! They have great conformation with a strong frame, they are thick-boned, have impressive top-knots, nice thick short muzzles, and overall a beautiful and pleasing look. Angelina seems to have very strong genetics! Angelito is a fleece producing machine! His staple length is quite impressive and every year Angelito has produced over 10 pounds of fleece. Incredible! Angelito would be a fabulous herdsire for any farm with his amazing stature, fleece, and lineage. His sire is Maple Brook Angelo, a beige male who has won champions and many blues.